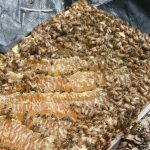 SUPER productive bees in our Nuc box BEEHIVE – beekeeping equipment. NEW VIDEO – Custom Made Nuc box BEEHIVE decorated by bees themselves. http://www.mahakobees.com/store.html looks briefly at our custom made beekeeping nuc hive which our hyperactive and super productive honey bees filled to the brim with burr comb and golden honey. We also show you a close up of our handmade wooden hive entrance reducer which assists new bee colony splits in protecting their hive entrance until they grow in numbers. So when would a budding beekeeper use such a small beehive, or a nucleus beehive? These hives are typically used for splitting your colonies or to relocate a small swarm of bees if you are lucky enough to find one. 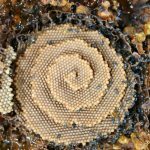 The hive itself can come in many forms, shapes and sizes. 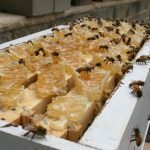 Standard width is 4 or 5 Langstroth style full depth frames and the hive body itself is usually made out of wood, much like a normal full size brood chamber would be with an entrance and a top cover. 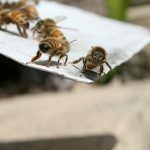 There are also polystyrene and cardboard versions available in various local beekeeping supplies outlets, but these are used for transportation generally. 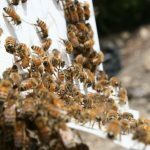 The nucs can also be user to raise queens if you have lots of beehives and want to save money on re-queening. Once you order one (or better yet, make one), it is usually flat packed like other timber beehives and needs to be assembled. It functions exactly the same way as a normal full size hive would, but the space is smaller and most importantly, the hive entrance is much smaller in width, which enables the new guard honey bees to protect the colony from being robbed, attacked or invaded by pests such as the wax moth and small hive beetles. 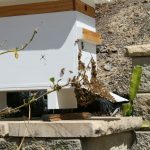 We add an additional adjustable hive entrance reducer which further restricts the opening because the bees in their first few days after migration only have a few guard bees available for hive protection, so the reducer helps by reducing the opening further minimizing their exposure to external threat. 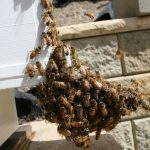 Once the colony fills up all the frames and you have a healthy fertilized and laying queen, you can either migrate them to a full hive or add a second level to the nuc. 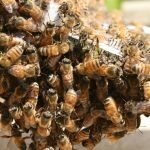 You will need to make that decision depending on where you live and how strong your bee colony is as well as other factors such as the season you are in, availability of food and flowering plants, and availability of your beekeeping equipment. 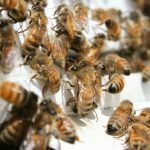 If you are interested in splitting your hives and making your own bees or would like to try rearing your own queens, or you just like the look of these hives, come and visit our simple online beekeeping supplies eStore at: http://www.mahakobees.com/store.html and have one shipped to your door today. We appreciate your support and invite you to click the thumbs up, share and subscribe if you enjoy our content. Thank you for visiting. Also, a big thank you goes to Kevin McLeod for providing his royalty free music “Sidewalk Shade”. We appreciate your kind contribution – (incompetech.com).